Ivane Makharadze, the Georgian riders' first acclaimed leader, spent his childhood in the small village of Bakhvi. When he was fourteen years old, his father asked him to ride to a distant village - Bakhmaro. Fond of horse riding, the young Ivane was more than happy to oblige. He fast rode till he got thirsty and dismounted at the spring. The sweaty horse, left unattended, gulped down too much cold water and died. Ivane came back with only a saddle on his back and accepted a deserved thrashing from his father. The boy, ashamed of his failure could not tolerate his offense and ran away to Batumi. It was then 1880 and by that time Batumi was declared a tax-free seaport. There he bumped into two young men from another Georgian region, Racha, which were employed on one of the ships. With their help Ivane was introduced to the ship’s captain. The captain grew fond of the short but lively fellow and gave him a job. The ship weighed anchor the next day and arrived in New York harbor almost a month later. By that time, fed up with his exhausting and boring job, Ivane quit and after days of aimless wandering picked up another job at a bakery. The rest of the story is a bit vague, but a year or so later he surfaced as a cleaner at one of the circuses in New York. His diligence and penchant for horses caught the attention of an Arab rider employed by the circus and he was again hired. From this point forward, Ivane was responsible for taking care of the horses. He worked really hard. With his circus earnings, Ivane bought his first horse and soon was asked to perform trick riding for the circus. Clad in his national dress he pioneered the trick of grabbing coins while riding. His successful debut allowed him to buy a second horse and become increasingly independent. Only now, when he had enough personal savings, did Ivane dare to send a message to his parents telling them where he was. 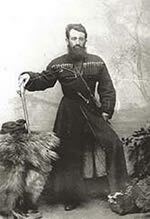 In 1885, shortly before Thomas Oliver's appearance in Georgia, Ivane Makharadze returned to his homeland. This story suggests that Oliver might have known about Makharadze's odyssey in America, and as a result, he knew perfectly well where to look for the Georgian riders. 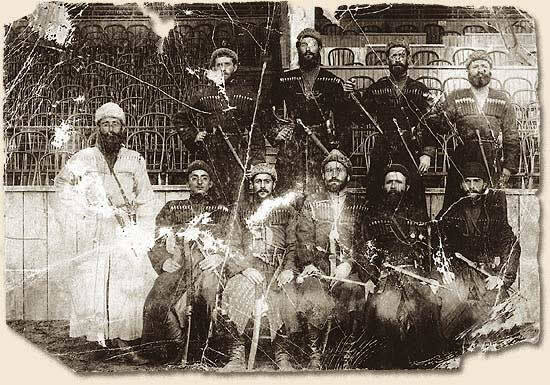 Though the public equally respected all Georgian riders, there also were favorites who were treated as larger-than-life-heroes. Luka Chkhartishvili was definitely one of these. 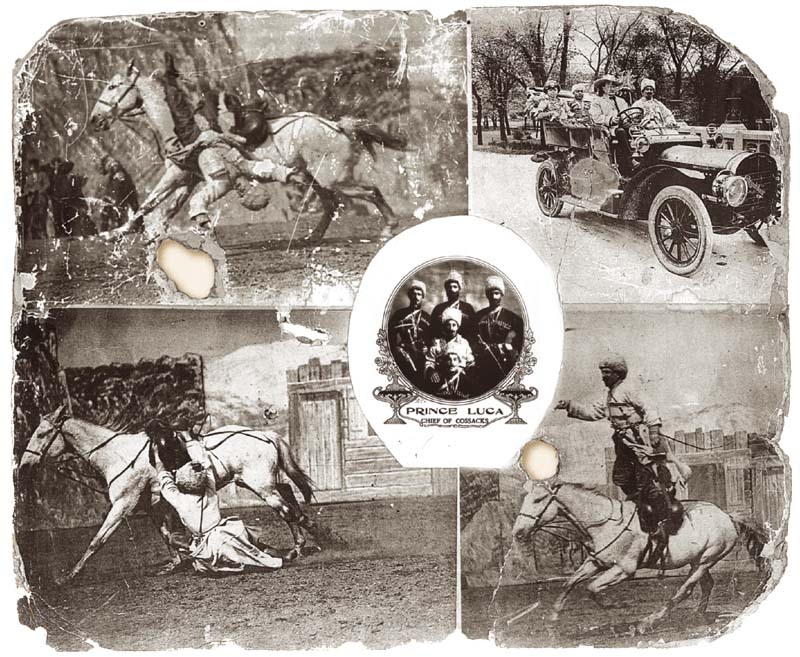 According to the Georgian newspaper Kvali (March 9, 1897), “ His exceptional riding skills make him incomparable; all marvel how this man became so consummate in his native village.” Prince Luka arrived on the scene in 1892 and performed until the beginning of the First World War. By origin, Luka was a goldsmith from a relatively well off family. Despite this, he was illiterate (he couldn't even sign his name in a passport) though, later he learned not only how to read and write in Georgian, but mastered English as well. Another well-known Georgian rider Veliko Kvitaishvili recalled, “When I was 13, there was a lively, animated, sparkling kid, a goldsmith's apprentice. His name was Luka Chkhartishvili. He adored horses and spent most of his free time galloping them in the field. Even back then, he was considered the best rider in the village of Lanchkhuti.” According to another rider, Lazare Jorbenadze, just before another trip to America, Luka organized a training field in front of his house where 10 riders could exercise every day. The Daily Tribune wrote on April 14, 1901, “The wonderful horsemanship of Prince Loucca has made him one of the attractions of the show. The Prince comes from Batoum (Batum), which is two and a half miles from Odessa, and joined the show nine years ago. The Prince is said to have got his title from his fellow countrymen just as the Indian chiefs get their titles from their tribes. Where he comes from he is called the Hetman, meaning headman. He is not of the royal blood and, as Russia is well supplied with princes it is not expected that the title will be envied. There is not a prouder man connected with the show than he, and one of his esteemed friends is Black Fox, the head Indian chief. An accident happened three years ago, which has cost him grief since. While standing upright on the horse the animal stumbled and broke its neck. ” (Note: before that, on August 14, 1896, The New York Daily Tribune reported that Luka had a near death experience in Indiana). One member of the audience, a sailor, told The Daily Tribune's journalist, “It's an amazing sight, watching him riding on his head. I have traveled to many countries but haven't seen anything like that before. I'm sure he can shave while riding a horse.” According to an article in Tsnobis Purtseli dated December 21, 1897, “Mr. 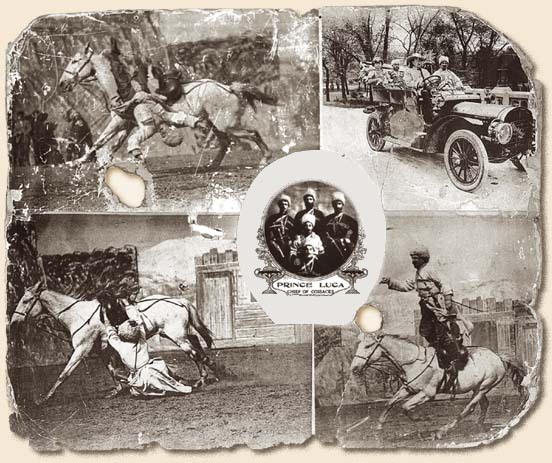 Chkhartishvili received a gold medal for his riding skills inscribed with the words: “To Russia's famous player from American society.” Other newspapers wrote, “The twelve Cossacks are in charge of Prince Lukka, a man of royal blood, and who, while he cannot speak much English, is as polite as a Cherterfield” (Baltimore American, September 30, 1895), “Their leader, Prince Lucas, distinguished from his band by a costume of snowy four, rode with all the abandon of a madman, hanging to his fiery steed by the point of his mall boot. After the show Lucas turned out to be a mild-mannered and charmingly pleasant gentleman, who spoke in softest tones of his “papa” and “mamma,” his “sweet little sister,” and his happy home.” (The Dispatch, August 31, 1897). Here's another interesting quote from Fred Gipson's book which the author dedicated to Zack Miller, one of the owners of Millers Brothers' “101 Ranch,” where Luka Chkhartishvili worked from 1908 – 1914, They were all packed, and Zack was in their quarters talking to them when in walked some British officers with orders to put the Cossacks on a boat going to Belgium. From there, they would go into Russia and eventually into the war. Lucca, the head of Cossacks, broke down and cried like a kid.” Zack tried to console him. “When this is over, he said, “I’ll still have a place for you boys.” But Lucca shook his head. “For us sir, he said, “It is all over now. We shall never see the 101 again.” This conversation took place in London in August 1914 after the beginning of the First War. Indeed, Luka never managed to get back to America. He wanted to apply for a citizenship but couldn't for reasons that are unknown. 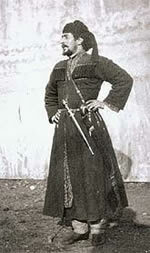 Alexis Georgian (Gogokhia) went to the United States in 1894, after being excluded from a theological institute in Tbilisi. In New York he took a variety of random jobs and learned English, until, in 1897, when he contacted Luka Chkhartishvili and joined Buffalo Bill's Wild West show. He stayed with the show till the end of the 1899 season and later, in 1900, he started working with his own group. That is the time when he changed his name to Alexis Georgian, although he also performed as Captain Georgian, Colonel Georgian and Prince Georgian. It was said that by 1903-1905, he was in charge of practically every Georgian group in the States. It is interesting to note that the government of Georgia's short-lived democratic republic (1918-1921) invited him to take the post of Georgia's ambassador in the United States – a post that Gogokhia refused. He died in 1949 in Minneapolis, Minnesota.